You will have to swing very, very wide of the northeast corner of the sea. The first barrier is Crimea. This historic region has civil order, so you are safe, but it is disputed, which makes it a politically bad choice. For centuries it has been home to Russia's largest naval base and only warm-water naval base. 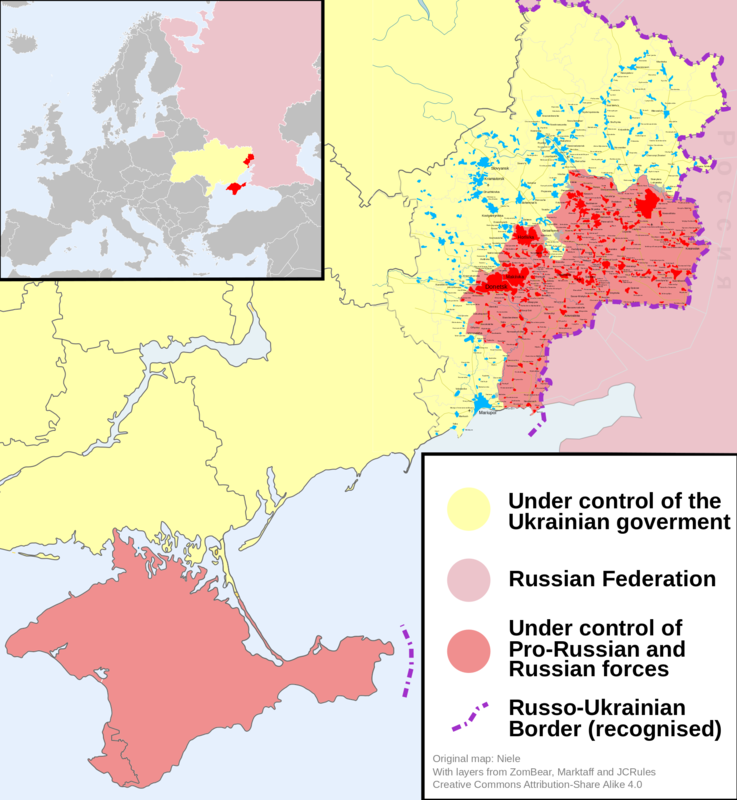 It was part of Russia a long time ago, but in the 1950s the USSR leadership moved it from the Russian SFSR to the Ukranian SFSR: not unlike, say, moving that weird bit of Virginia north of Chesapeake Bay into Maryland. After the USSR breakup, it was universally understood that due to Sevastapol's importance, it would remain a Russian naval base indefinitely, and treaties to that effect give Russia permission to have some rather large quota of troops in Crimea. With their families, and the fact that there is little other industrial base in Crimea, and with the Soviet Union's previous ouster of the native Tatars, the area became dominated by Russian sailors, veterans, civilians, families, and others with connections to Sevastapol. As an American, and a Yankee, I certainly won't say that any state can just leave based solely on a popular vote. If it was legal, and that is a very big question, the outcome isn't a big surprise. Suffice it to say, Ukraine cannot possibly recognize Russia's claim on Crimea. So Ukraine views even the slightest indication that you have been to Crimea as a flat admission that you snuck into Ukraine without going through Ukranian border controls. Obviously, presenting yourself to the Ukraine border guards at the Crimea border is such an admission, same as if you drove up to a US immigration office in West Virginia and asked them to land you in the USA. Expect to be refused or worse, so counterclockwise is right out. Russia is also itchy about people coming into Crimea from Ukraine, they want all entries to be from Russia. And they get to have something to say about it, because you have to use the new Kerch Bridge or old ferry to get across. It would be neat if there was a carferry across the sea, because that would allow you to go between Crimea and the Donbass and cross straight from Russia to undisputed Ukraine. But there's not, so it's just a barrier. This region, including Luhansk and Donetsk areas, touching the Sea of Azov and running north some distance, is a genuine war zone. It's right out. So this has you swinging far north, as far north as the width of the Black Sea itself. Is it still circumnavigation at that point? Not the answer you're looking for? Browse other questions tagged europe driving uk-citizens asia or ask your own question. How to get from the North Sea to the Black Sea (or Aegean/Adriatic Sea) via inland waterways? Will British passport holder with many Middle Eastern visas have a problem entering the US?